In lacustrine sediments, aragonite is a widespread mineral, whereas monohydrocalcite is a rare carbonate mineral. In the cold and high-attitude Xizang (Tibetan) Plateau, where aragonite has been commonly found in lacustrine sediments, there is no aragonite, but low-Mg calcite, monohydrocalcite and trace dolomite. The lake receives solutes primarily from surface runoffs and remains fairly constant water chemistry for a long time. The total CaCO3 percentage in sediments could be controlled by evaporation and inflow of detrital materials. 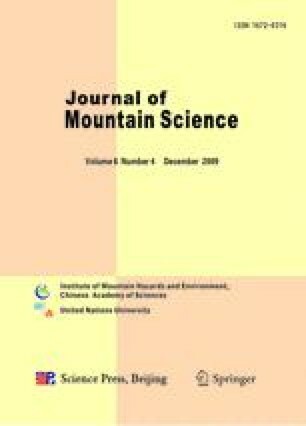 The absence of aragonite is unusual when compared to other lacustrine sediments from the Tibetan Plateau. This could be due to low Ca/Mg ratio, low salinity, low Mg and Ca concentration. Monohydrocalcite might precipitate from the lake water mediated by biological activities. Low-Mg calcite originated from minor ostracoda shell and the precipitation of lake water with biological activities.